My Grannie did an amazing job of taking care of me. And I suppose that right now, I could use a little TLC, especially some from her. When Hannah was born in 2005, Abby was only 18 months old. Grannie came to stay with me for a whole month, which included the Christmas holidays. She originally thought she'd spend most of her time sitting with the baby, but then Hannah turned out to only want me 99% of the time, so Grannie was continually chasing after a toddler...with a smile. We'd fix lunch together after the girls had been feed and went down for their naps (she always told me I made the best sandwiches). And she'd encourage me to just sit and read the paper. There was no pressure to entertain her and she knew those few moments of silence and "me time" were precious. The girls had matching Christmas outfits that came with the same-size headband. Grannie sewed Hannah's to make it smaller and didn't say a word about it at church when I left it at home accidentally. At night when the girls were down and Grannie had had a full day of doting on the girls, she still let me put my head in her lap and she'd stroke my hair. Somehow, I figured I was just never too old for this. On Christmas Eve, I still couldn't fit into most of my pre-pregnancy clothes. I was near tears about the fact I was wearing a maternity shirt to church. And she just looked at me and whispered, "You look just beautiful, darlin'." And somehow, that was enough. I know she cooked and cleaned and played and for those things, I am grateful. But it's these little things that were just for me that I hold in the deepest places in my heart. In the remembering of these things, I get teary-eyed. My mouth down-turns. And I weep. She's been gone three and a half years, but the way my heart clenches sometimes, it feels like yesterday. I write this because I'm an external processor, because I love my Grannie, because the more I write down the memories, the more I'll remember them through the years. But I write it for you, too, if you are grieving this holiday season. Because sometimes, we need to be reminded that grief is a long process and that it's okay to cry about things society says we should "be over by now." "Everyone can master grief but he who has it." So, sweet friend, we can grieve and remember together. I would love to hear some memories of your loved ones today. Share them with me? My mother died when I was 32 in September of 1984. My son had just turned 8, Leah was 3 1/2. I get very melancholy the first week or so of the Christmas season because all the Christmas music reminds me of her--She loved to sing....and I do, too. I'm sad about the times she never had with my children and I'm sad as a grown up that I had so little time to share with her. I loved reading about your lovely Grannie. How wonderful to have those lovely tender hearted memories. She sounds like a beautiful lady. I would like to have met her. Oh Jen I am sitting here in tears. Such beautiful memories of a woman who loved you dearly. I love my Mamaw, too, and cherish her so much. Thank you for linking with Woman to Woman's Word Filled Wednesday! God bless! This is just lovely, Jen. And so very true. 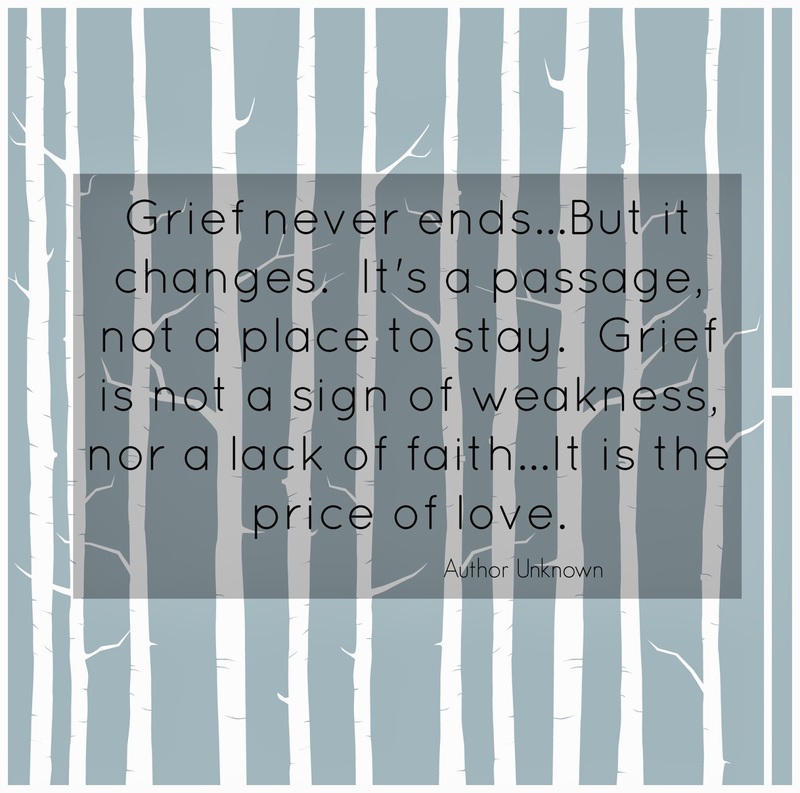 Grief never goes away entirely - we carry pieces of it always. I tried to write about that over at A Deeper Family today, because I think it's so very important. Thank you for this beautiful reminder. Oh those Grannie's hold a place in our heart that no one can touch, because as you said they touch the deepest part of our heart that we hold so dear. As I was drying dishes at thanksgiving (which use to be my grandma's job) I got a little choked up, it was a favorite time of my thanksgiving day. It is just the little things. jen, i fell in love with you while reading about your grannie those 3 yrs ago when i first found you in the blogosphere. and of course i have started and stopped blogging so many times -lots of growing up to do in between i guess. i never had a grannie really of my own, but i do have a good memory of my dad who died when i was a kid. every evening he would lay on the floor in front of the woodstove and i would sit by him and he would peel one orange and one apple. i would watch as he made a perfect long single peeling that didnt break from the apple and would be mesmerized that he could do that. he peeled them with his pocket knife that i have wondered what happened to after these 30 yrs,. the apple and orange were our nightly routine. recently i met with some cousins that i hadn't seen in a very long time and i asked about the knife, and one cousin found it in her deceased dad's (my uncle's ) things. she gave it to me a couple of months ago. and i am eating an apple and an orange right now and thinking of him, still grieving even after 30 years! and it is good grief you are right :) you will always remember those who have gone on and touched your life so magnanamously <---is that a word?...never stop remembering them. i think they are always much much closer to us being "dearly departed" than we can ever realize while alive on earth. You honor her so well with your words. I too find holiday bring memories of my parent who are both gone and some dear friends now in heaven. Just made a recipe the other day using the handwritten ingredients of one of my best friends who died four years ago. Sad yes, but a certain warmth and reassurance too. What beautiful memories you have of your Granny, Jen! I too, remember both of my grandmas with tremendous love and with a smile. Tomorrow will make four years since my Dad died. Christmas has never been the same. But God truly does give grace to handle each Christmas season. I am entering into this holiday season with fresh grief because my father-in-law died just a little over a month ago. Yet, I spoke with a woman whose mom had been gone three years now and she said she misses her even more now. That sounds like what you are describing and I can even see that perhaps in some ways we miss them even more through the years. There is so much to do right now and it takes most of my energy to do because I feel drained. So that I don't even feel that sad most of the time although I know that I am grieving. I actually looking forward to more moments of sadness and missing him. I love that you say that you are an external processor -- me, too! Thanks for sharing and processing out loud. What a wonderful memory to have your grannie for a whole month. How lovely!